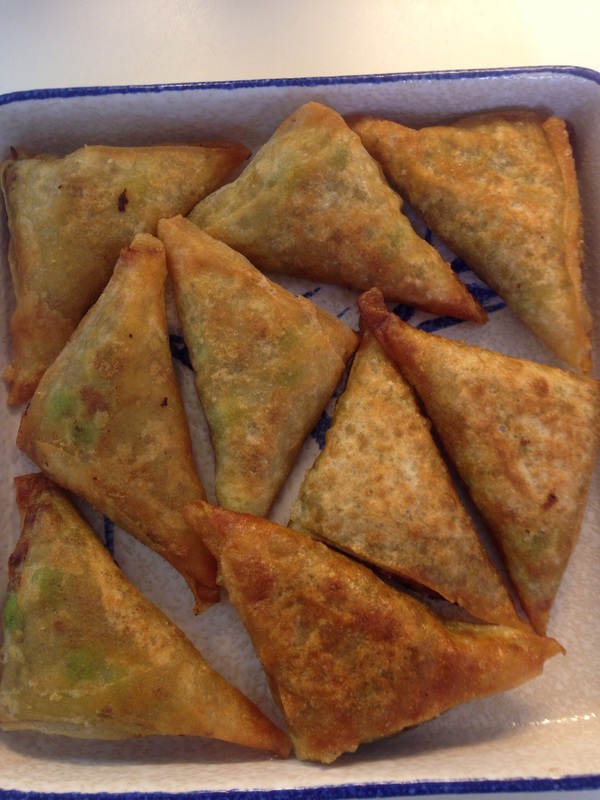 These crispy mince and pea pastry triangles are very different to the more commonly found “Indian” version which has a thick crusty pastry. I am not sure what the origin of this style of pastry is other than this is how they are made by the Indian community in Durban, South Africa and this is how I grew up eating them. Back then in South Africa with larger households often with dedicated cooks,hours were spent making the crispy pastry from scratch and creating these delicious appetisers for special events or just afternoon tea. When we moved to Australia my mum, Tilly, found the ideal replacement pastry to be spring roll pastry initially found in Chinese and Asian specialty shops but now readily available in mainstream supermarkets. 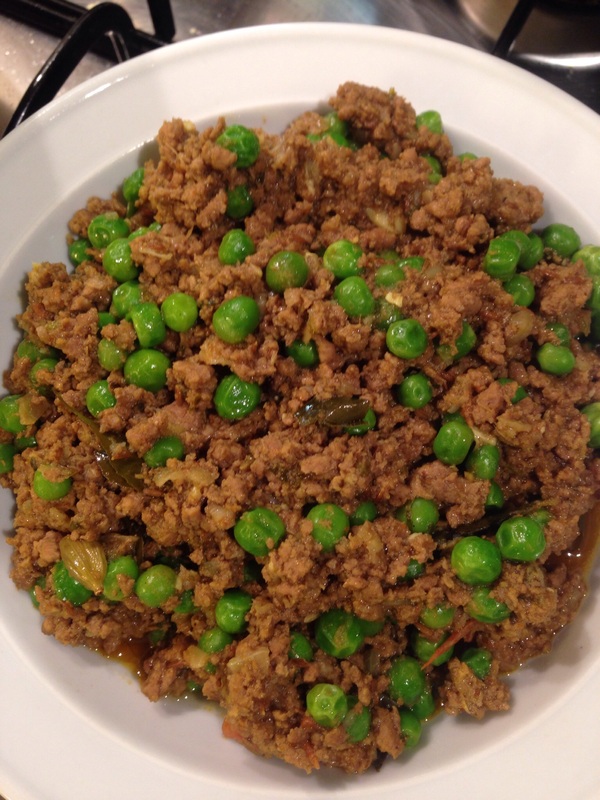 Fillings can vary between fish, potato and peas, chicken mince curry…but my favouite remains the lamb mince and peas. All my friends loved coming over to Tilly’s for her freshly made samosas and she has actually been called upon for lessons by some samosa addicts! Here’s the recipe with some hopefully helpful photos to help with the fiddliest part which is folding the triangles. Pastry “glue: 2 tspns flour mixed with 3tspns water to make a thick flour glue in a seperate bowl. 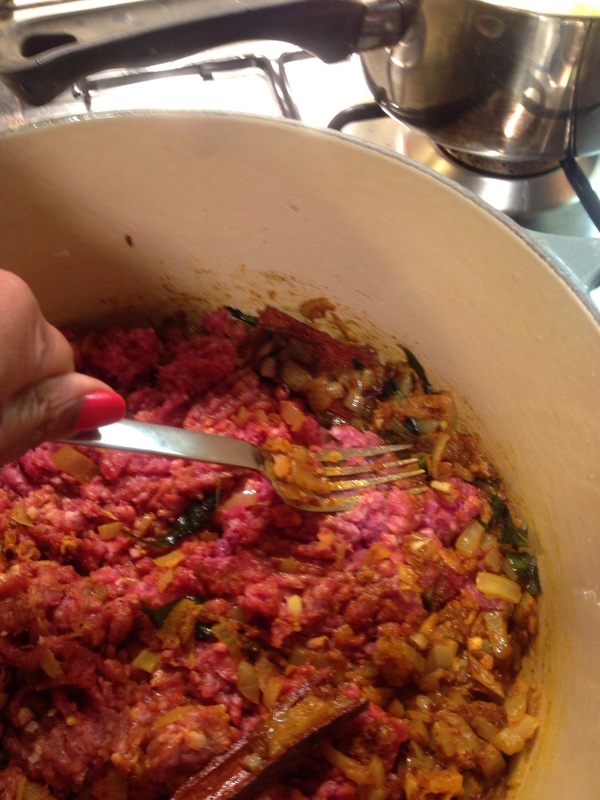 Add mince to brown and mix thoroughly with onions and spices, breaking up all lumps of mince using the back of a fork. When mince is totally separated and browned, add tomato, salt and coriander. Break up all lumps with the back of a fork as you mix through onion spice mixture, over medium heat. Add water and Simmer over medium heat, stirring regularly for 35 minutes until mince is cooked and has absorbed the flavour of the spices…you are aiming quite a dry mixture with no “sauce” so limit the amount of water you add. 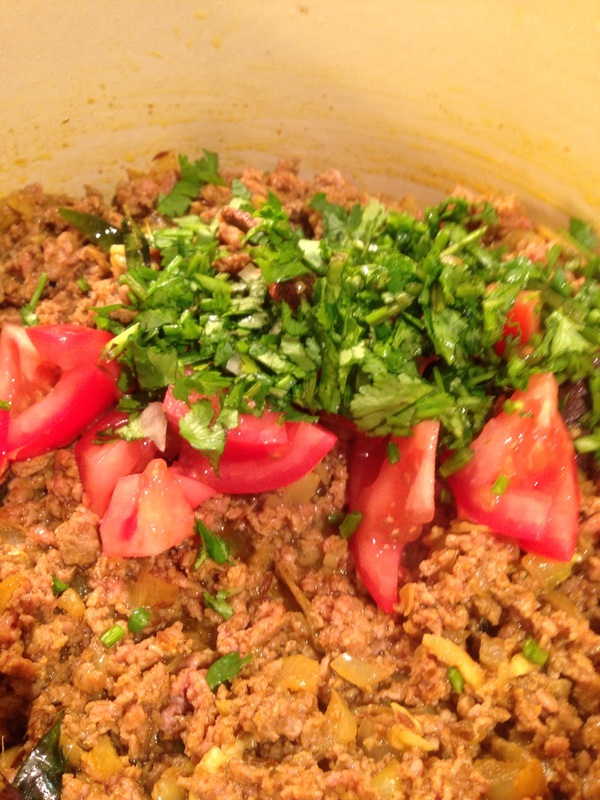 Add tomato, coriander and water to mince mixture and simmer for 35 minutes. Place a teaspoon full of mixture within 4-5cm from the top edge, turn the top edge of the pastry turning the right corner over to the left edge, over the filling to create a triangular pocket where the newly created right corner is completely “closed so the filling can’t fall out. Turn the right hand edge to the left edge, over the top of 1 tspn of filling, enclosing filling, pushing it all in if needed and creating a triangular pocket. Make sure your right corner here is enclosed …no hole for filling to escape from! This is the most important step to get right because you will then easily be able to turn the triangle over and over until you get to the end and can seal up the pastry with your glue. 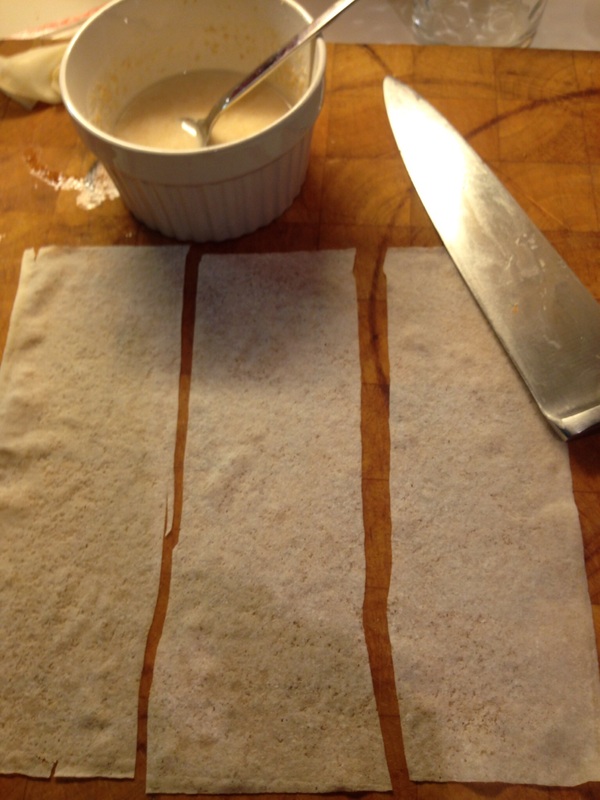 Different stages of “turning” the pastry with filling to get to end of the strip, use glue along the way as required. If you do find gaps or pastry overlaps along the way, use your glue to seal up the edges to craete a fully enclosed triangle. 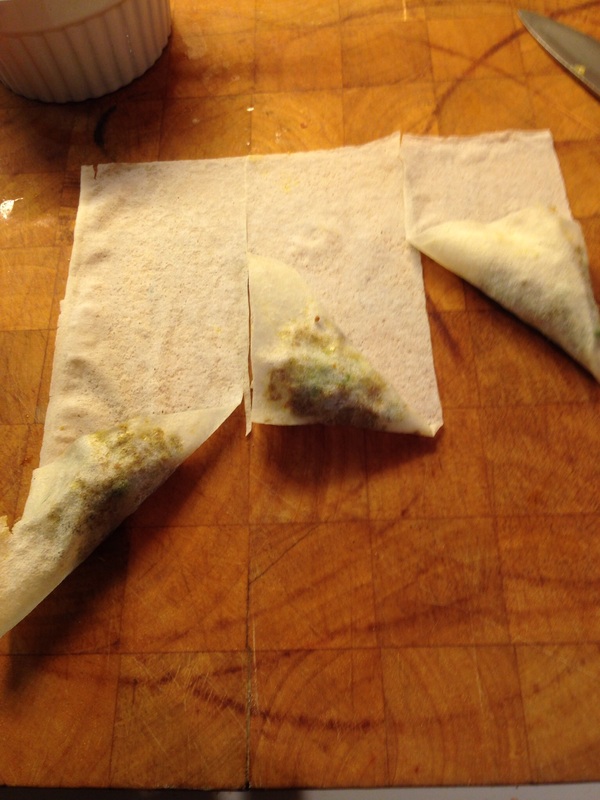 Spring roll pastry is quite “hardy” so don’t be afraid of it and as they say practice makes perfect so if might take a few attempts before you get the hang of it. Makes 24-36 small samosas. 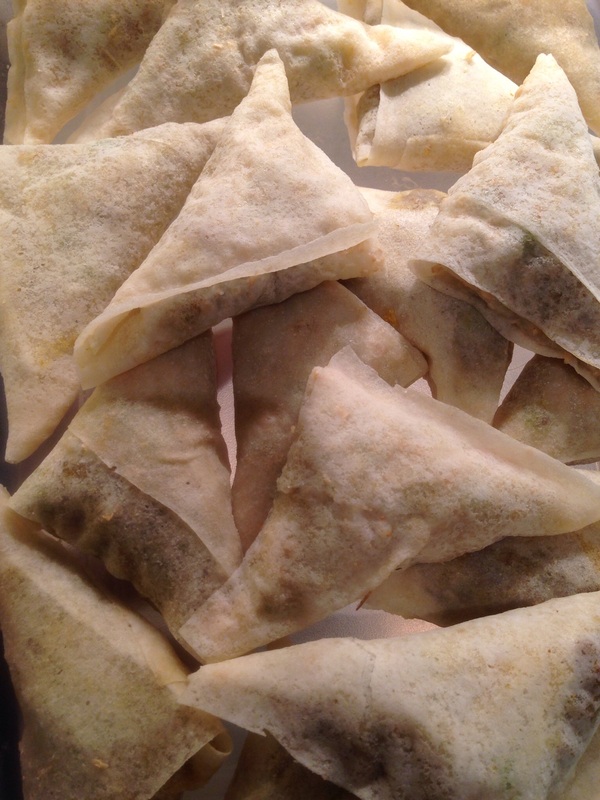 You can freeze the samosas or Refrigerate for an hour or so to allow glue to seal before shallow frying in vegetable oil over medium heat until golden brown on each side. If frying directly from frozen, then you will want to lowe the heat slightly to allow the filling to defrost and heat through. 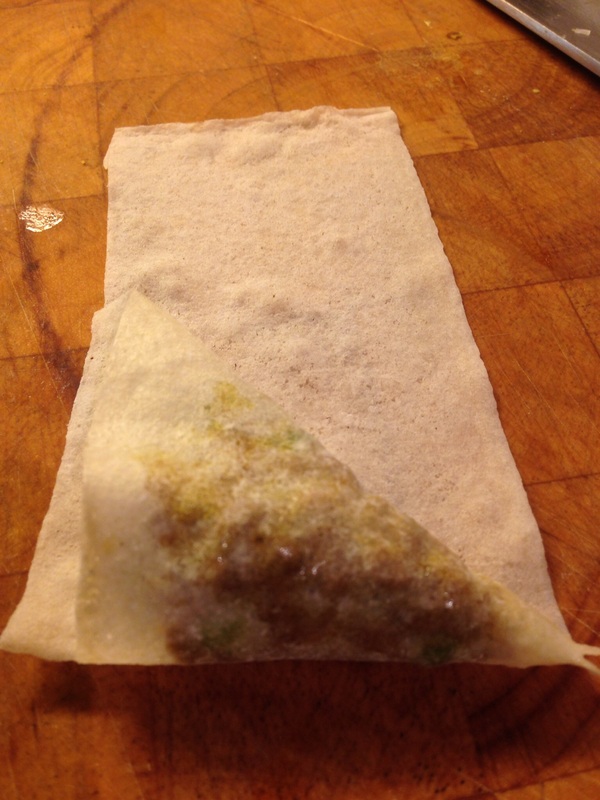 One golden brown, place on kitchen paper towel to absorb oil. They really need to be served hot and crispy for best enjoyment. Delicious dipped in plain yoghurt or spicy chilli sauce for extra bite! I love samosas, and this version looks even better! Thanks for the recipe. Dipped in Mrs Ball’s Chutney – perfect!